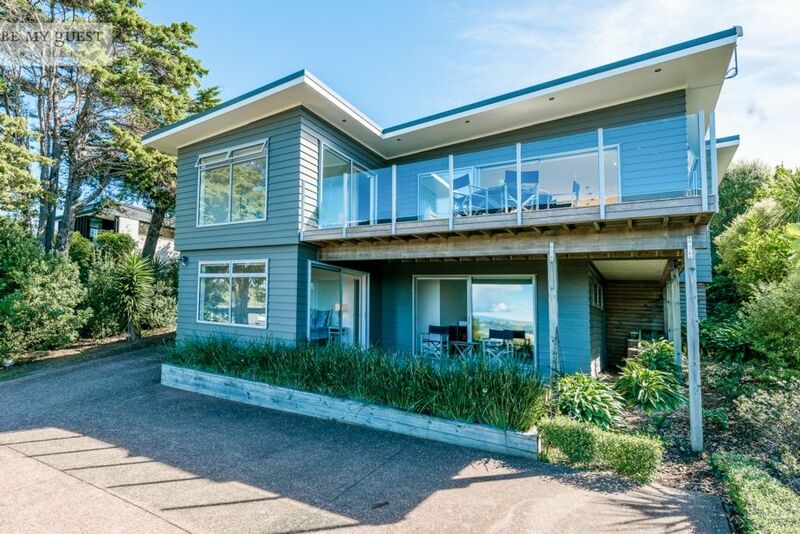 This beautiful, stylish residence is set in a lovely peaceful location overlooking Oneroa and Huruhi Bay. Just a short 7 or 8 minute stroll will take you to the centre of Oneroa Village or to the safe, all tide swimming Oneroa Beach. The home is set over two levels, with the main living areas and two of the bedrooms being on the upper level to take advantage of the magnificent vistas over the Island and Huruhi Bay to the vineyards on the hillside of the Te Whau peninsular. Simply stunning! There are three large decks, enjoy the morning sun on the front deck and the afternoon sun on the rear deck, with wide bifold doors opening on both sides of the house to these spacious outdoor living areas. On the lower level is a further bedroom and bathroom, a small kitchenette , and a TV/Study room which doubles as a fourth bedroom. Both the bedroom and the Family room open onto the large covered deck. Being so very close to Mudbrick, Cable Bay and The Estate, this home is perfect for wedding accommodation. Please note this property sleeps a a maximum of 6 adults. We can agree to 2 extra children for $25pppn. The property is not to be used for any parties or gatherings. Beautiful clean and well kept house in an awesome location. Lovely accommodation, well outfitted, and in a great location. Wa Kainga is an ideal holiday home with access to Oneroa and beach as well as 3 vineyards within walking distance. Something for everyone. The spectacular views would make is as much fun in winter as summer.